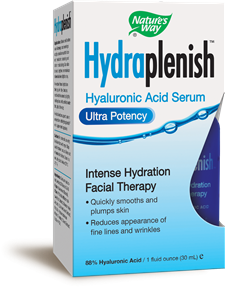 Hydraplenish(TM) Hyaluronic Acid Serum 1 oz. Hydraplenish™ maximum potency serum with 88% hyaluronic acid is an ultra-intense, moisture-locking therapy that frees skin from visible signs of dryness in a way no other moisturizer can. Use regularly and the years seem to disappear. Smooth, supple, plump skin is instantly revealed. Skin rediscovers the radiant look you remember. High molecular weight hyaluronic acid absorbs more than 1,000 times its weight in water to smooth away the appearance of fine dry lines in seconds. Water-plumping technology creates in-depth hydration to visibly "fill in" wrinkles. Concentrated moisture barrier restoration helps keep moisture in and external irritants out. For dual-action support, use in conjunction with Hydraplenish® oral supplement capsules.